Lemon Cucumber Mint Water is the third fruit and herb infused water that I want to share with you. Just this time we have cucumber lemon with mint to rehydrate you this summer! The purpose of this series of infused waters is to remind us to drink water because water flushes out all the toxins in your body and gives you the glow that your skin needs! Making your own infused cucumber lemon water with mint is not just fun but also so very healthy for your body! What is Lemon Cucumber Mint Water? Lemon Cucumber Mint Water is a cold water infusion with these ingredients. So the fresh ingredients are left in the cold water in a container such as a simple jar, bottle, glass or a special fruit water infuser. Over a period of a few hours, the water takes over the flavors of the fruits, herbs or in today’s case a vegetable, the cucumber. The result, water flavored with the ingredients. I share more details about fruit infused waters in my strawberry infused water post. These fruit infused waters are considered detox waters. That is why you might have come across ready made infused bottled water in your local supermarket. Those might be convenient, however, making your own gives you at least the freedom to choose what you add to your infused water. So, what does detox water do? Why should you consider it? Detox infused waters with fresh herbs, fruits, and vegetables, such as this lemon cucumber mint water, help you to flush out toxins in your body. At the same time, the infused water will hydrate your cells and the ingredients used will have each their own effect. The mighty health benefits of lemon, cucumber and mint are amazing if combined and used wisely as part of your diet! Lemon or Lime can be used in this particular infused water. Both are stuffed with Vitamin C, Ascorbic Acid, which basically helps your body to keep the flue and the common cold away. Besides, the ancient medicinal Ayurvedic tradition also mentions that lemon in water gets your digestion to work. Cucumber is known to rehydrate. The humble vegetable consists of over 90% water, the bare look at a cucumber alone gives me a fresh feel! What the cucumber does, it cools the body from within and provides the missing fluids that our body needs. 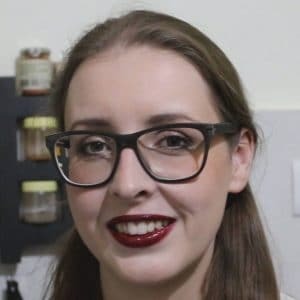 Because cucumbers are high in silica, they promote healthy connected tissues, which in turn can help you tone your skin and make your skin look younger, fresh and radiant. Mint is a herb known to be very refreshing. The green herb is also known to aid digestion but besides that, it has anti-inflammatory and immune boosting properties. That is why the Mint is a popular herbal tea ingredient in many places all over the world. Your flavored Cucumber Lemon water with mint will be your new best friend this summer. Together the lemon, Cucumber, and Mint make a powerful and perfectly suitable trio of ingredients for your infused water. The cucumber lends the water a subtle exciting flavor, which is great for a change! In that case, it can be considered a natural detox water for weight loss. Of course, you shouldn’t overdo it by drinking just cucumber lemon mint water. Try to prepare and drink it frequently but in a balanced manner. For example, prepare a portable bottle in the morning (see further below for container suggestions). Drink it over the course of a day and try to enjoy other liquids as well such as plain fresh water (with minerals if possible), teas or herbal teas and even freshly pressed fruit juices. 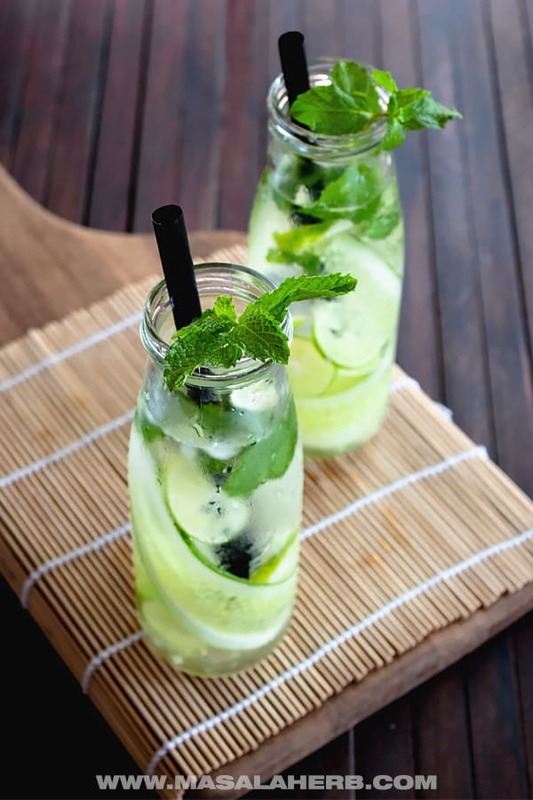 Eat a normal balanced diet, exercise your body and mind, sleep well and you will be successful in your weight loss with this lemon cucumber mint infused water. 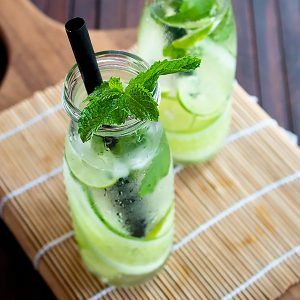 What containers to use to make Cucumber Lemon Water with Mint? Over the years I came to the following conclusion regarding the best containers for me infused waters such as the one with lemon mint and cucumber. You can prepare detox water in a simple drinking glass, a pitcher or a bottle. The easiest way to prepare cucumber lemon water is to use a glass. I usually don’t like to do it this way because it involves leaving the glass with the ingredients and water in the fridge. That means the glass is open and your precious detox water will take in funky fridge smells, which is really not that nice. So, if I plan on making a cucumber, lemon mint water in a glass, I will use mason jar glass which can be closed with a lid or even better, I use these small milk bottle look-alike glass (as seen in the pictures) because they are elongated and that way the ingredients infuse really well into the water. Infusing Water in a pitcher works great if you plan to please a big crowd. So, for example, you have your book club over or the neighbor’s kids are going to hang out with your kids at the pool. You get the picture. When using a pitcher get one which fits into a fridge. My fridge is always stuffed with goodies so I use something like a square pitcher and it should be a solid glass pitcher. You get those Bottles with a filter at the core of the bottle and that’s where you can add ingredients to infuse your water in the bottle. Most probably you have come across these before, they come in all shapes, some are pitchers others are portable gym bottles. Those are useful if you plan on making infused waters more often then just once a week. At the same time, you can take along a fruit infuser bottle to work, to college to the gym to the beach on a hike etc. You get the picture! 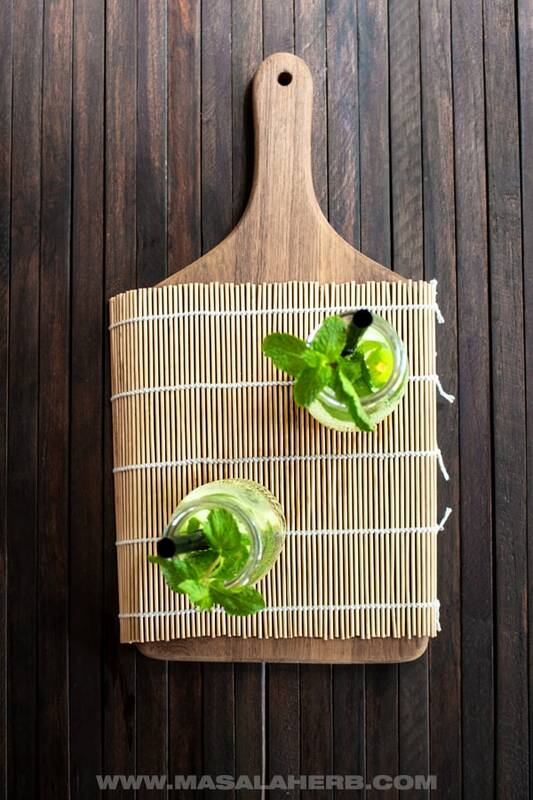 Homemade fresh infused water with lemon, cucumber and mint leaves. Great weight loss detox water or simply refreshing during hot summer days. Cut your clean Cucumber lengthwise into thin slices. Make sure your Mint leaves are clean and washed. 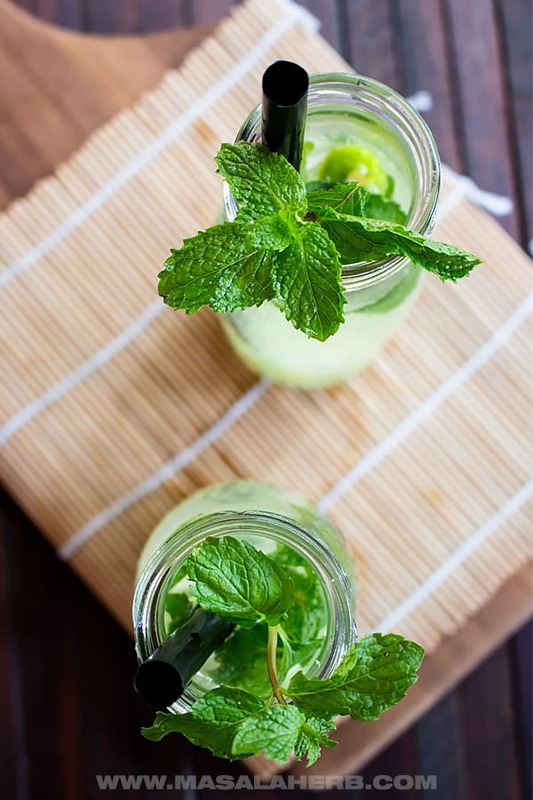 Place as many lemon/lime slices, mint leaves, and cucumber slices as you want into your glass/jar/bottle. The more you add the more flavorful your water will be. Just make sure that there is enough space to add water to infuse. Add Ice cubes and drinking water. You can enjoy the first round of homemade lemon cucumber mint water already after 30 minutes. Refill again up to 4 times max with fresh cool water and let the ingredients infuse each time again before enjoying the detoxifying infused water. Use organic lemon or lime because we will use the whole fruit to infuse the water and we don't want pesticides in our beautiful water. The same goes for the mint and cucumber. Use mineral enhanced water to add more nutritious values to your water. Use a glass or jar such as a milk bottle glass jar so that you can close the glass too for hygienic reasons. You can also fill up a pitcher or a portable fruit bottle infuser so that you can take it along with you when you are out for the day. Dear Reader, are you preparing fruit infused waters frequently? Hi, this may be interesting you: Fresh Lemon Cucumber Mint Water!